Throughout the Pleistocene, as the climate fluctuated, sea levels rose and fell in conjunction with the size of the polar ice caps. This process allowed oceanic wave-action to cut coastal terraces around the world. Subsequent tectonic forces then slowly pushed these terraces upward. Through other dynamic processes, beach materials like sand, gravel, clay and other rock have been deposited on the terraces at varied depths. What we now witness in coastal Mendocino County is the best preserved example of marine terraces in the Northern Hemisphere. Directly adjacent to the Pacific Ocean on the first step, wind sculpts coastal scrub and grassland on coastal bluffs or “Bonsai” beach and bishop pine forests (Pinus muricata). Further up the staircase-out of reach of the salty air-ample precipitation, Pleistocene and Holocene sand dunes, and the deposition of conifer needles nurture trees with deep roots and tall shoots. However, the most amazing staircase story begins just to the east of the ancient dunes. In the mid-section of the second step, and upward on each subsequent step, ancient dunes have cut off surface drainage, flushing perennial moisture onto the step. Via seepage and springs, moisture has created pooling basins that ever-so-slowly drain. Prolonged seepage leaches nutrients like calcium and potassium from the Pleistocene beach deposits, leaving behind sterile hard-pan soils. The year-round leaching, coupled with summer dryness and heating, nurtures an inhospitable layer called a Podzol Horizon (podzol is a Russian word meaning “ash soil”). This unique soil layer creates edaphic microsites. Certain hardy plant species–some now endemic–survive in spatial isolation on these podzolized terraces. Mendocino cypress (Hesperocyparis pygmaea), Bolander pines (Pinus contorta spp. bolanderi), and Fort Bragg manzanita (Arctostaphylos nummularia ssp. mendocinensis) are just a few of the unique plants that can be found on these staircases. 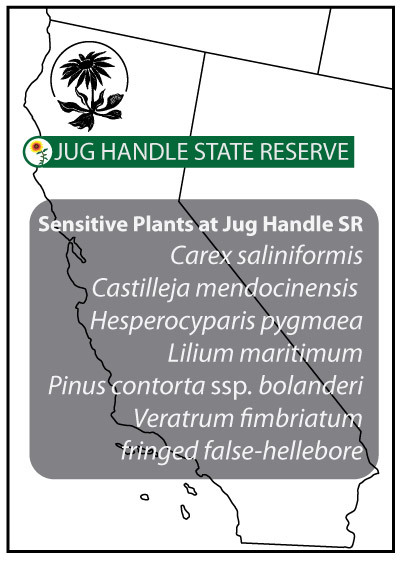 The California Native Plant Society has had a long history of working to preserve these botanically unique areas. In fact, the Dorothy Young King Chapter (formerly the Gualala Chapter) formed in 1966 when citizens of coastal Mendocino and Sonoma counties joined together to dig up native plants that were going to be bulldozed in the region. Later, in 2006, with pygmy forests designated an Environmentally Sensitive Habitat Area within the California Coastal Zone the chapter presented litigation against clearing pygmy forest for development. Take a journey to coastal Mendocino County and visit, what Hans Jenny called the best preserved ecological showplace of coastal landscape evolution in the Northern Hemisphere. This entry was posted in Education, Plant Exploring. Bookmark the permalink. What a great article! Clear and beautiful. Thank you. Thanks Susan- It was fun to write and even more fun to visit! 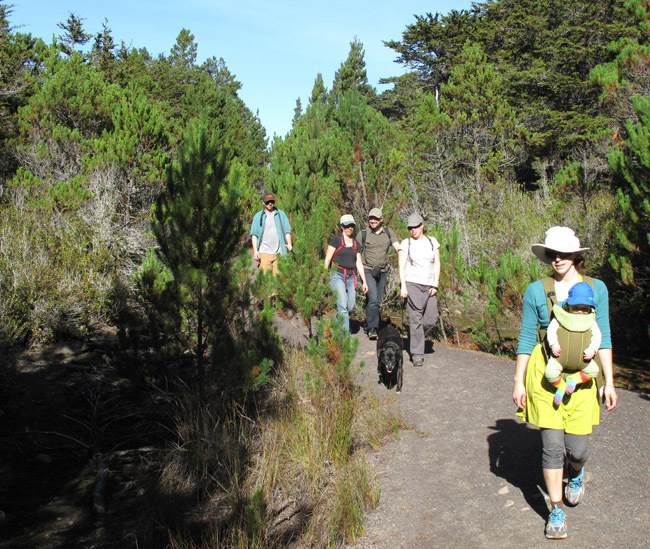 Recently (last week ) we investigated the Mendocino City Headlands and McKerricher State Park. Flowering Ca. natives included Heterotheca sessiliflora bolanderi, Grindelia stricta platyphylla, Corethrogyne filaginifolia,Erigeron glaucus and Orobanche californica ssp. californica.